Forces should be substantially reduced to serve a comprehensively revised policy: America should do only what can be done from offshore, using intelligence, drones, cruise missiles, airstrikes and small, potent Special Forces units, concentrating on the porous 1,500-mile border with Pakistan, a nation that actually matters. One of the things I never seem to hear much about is what the generals think would happen if we withdrew from Afghanistan. If the answer is that the Taliban is likely to take over completely, that’s one thing. But if it’s more likely that the Taliban and the central government would continue fighting, with the Taliban maintaining control over a limited area of the country and the central government maintaining control over the rest, that’s quite a different outcome. If, after eight years, the Karzai regime is so weak that the former is likely, then our task is probably hopeless and we should withdraw in the way Will suggests. But if the latter is more likely, would it really be necessary to go that far? 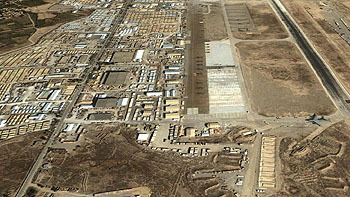 Why not offer to lease Bagram from the Afghan government for a billion dollars a year, offer some additional money in military and rebuilding aid, and then continue the mission of fighting al-Qaeda from there while leaving the Taliban to Karzai? We know how to protect a military base from an insurgent force like the Taliban, and fighting from there would be a helluva lot easier than trying to do it from offshore. This is probably a hopelessly ignorant suggestion. Does anyone ever try to maintain a military base in a country riven by civil war? I’m not sure. But it would be interesting to hear the experts chime in on this.